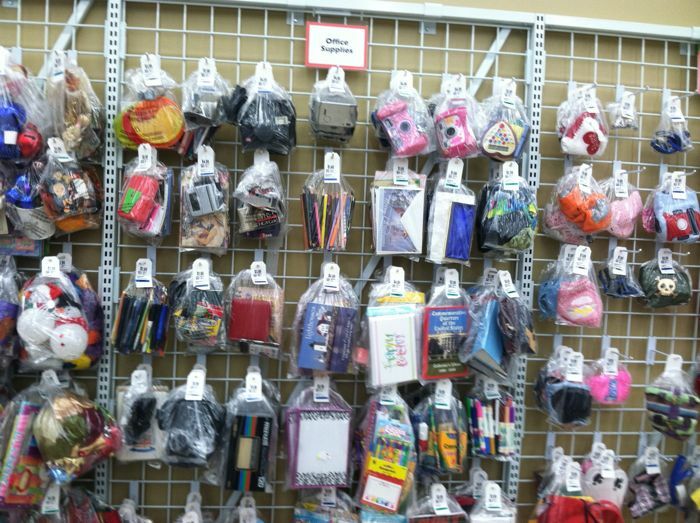 Look at this wall of crap. I’ve been visiting these bags at least once a week, for about two years. 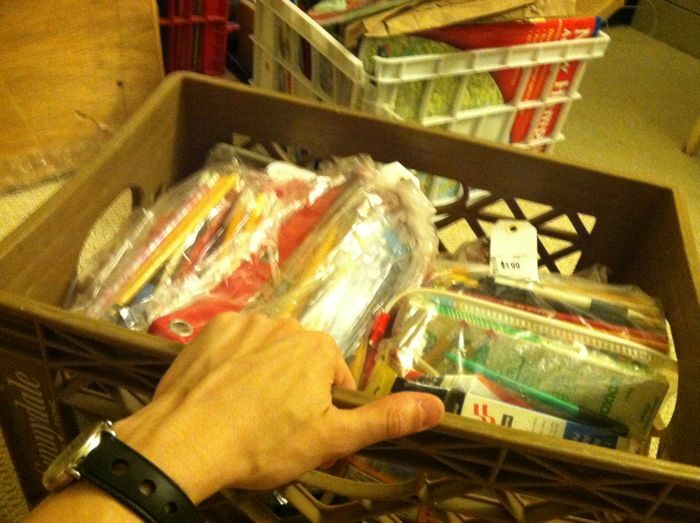 It’s the only place I can semi-regularly find old pencils for sale. And it’s right next to the book section at my local SAVERS thrift store, which happens to be just a few minutes away from the music store where I work. So, this crap is vehehehry convenient. What’s even weirder than accumulating all this stuff is the fact that I haven’t opened a single one of the bags. Because whenever I get one, I imagine writing a lovely little paragraph about it. Each bag tells a story, or at least hints at one. Sometimes I think I get a feel for the person who used to own the pencils. I’m afraid to open the bags before I write their stories. Take a look at this one. 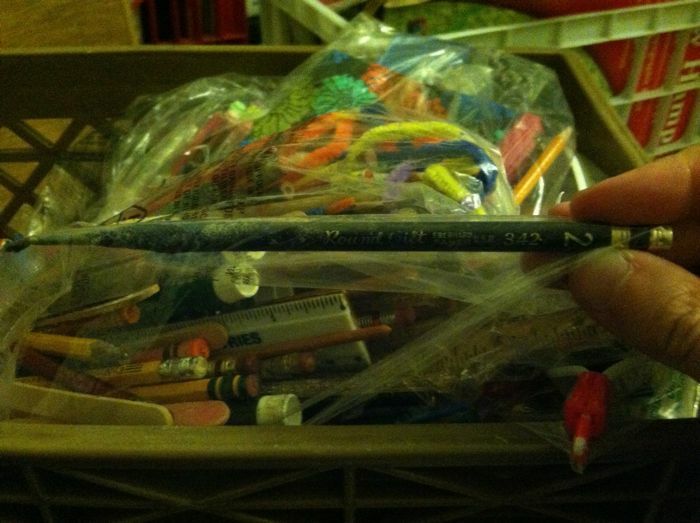 You can see an enormous, oversized ferrule on one of the pencils–which is a very rare find. 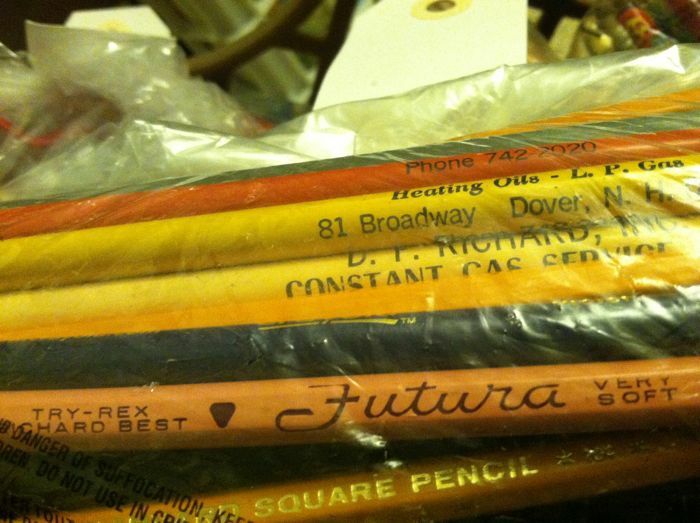 In the same bag as the big-ferrule pencil, we find a breathtaking pink Futura pencil, which is the pencil-collecter’s equivalent of finding vintage Corvette with no miles on it. Still in the same bag, there are some old vanity pencils for a Heating Oil Company. At the time I bought this bag, Dover was twenty miles away. Now it’s my hometown, and I can get to 81 Broadway on foot in a few minutes. I think I should take a stroll over there sometime. Check things out. Maybe I’ll bring one of these pencils along. Who knows what kinds of adventures might ensue? There are a few different designs for the same oil company. I wonder if this batch came from a loyal customer, or maybe from someone who worked there? Here’s another bag. This one has a few specimens of a pencil I’ve never seen anywhere else: The Rippowam No. 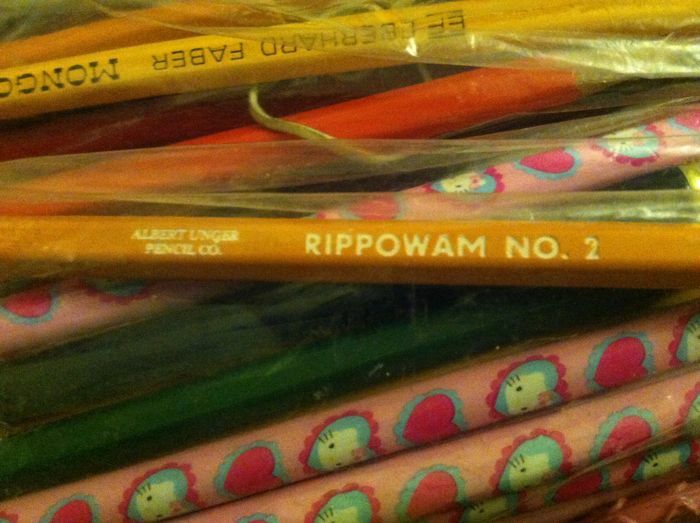 2. Who thought this was a good name for a pencil, and why? How many of these are left on the planet earth? 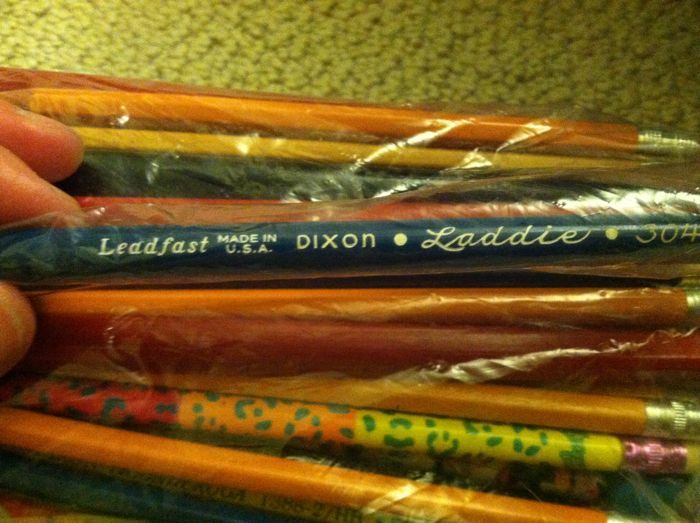 And look at the odd, old font on this Dixon “Laddie.” Do they make jumbo pencils anymore? I remember using them in first grade, when we were Learning To Write. We drew giant upper- and lowercase H’s on enormous sheets of paper. We used big red pencils. I remember seeing this bag of miscellaneous junk from about twenty yards away. When I noticed the nice, old, brown ,wooden ruler, I thought to myself, Bingo! 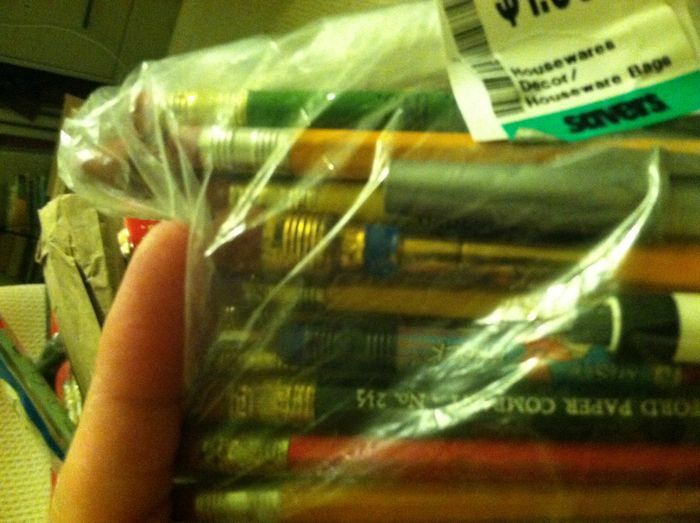 In the same bag, there’s a pencil that’s been converted into to a paintbrush. So frugal and resourceful! 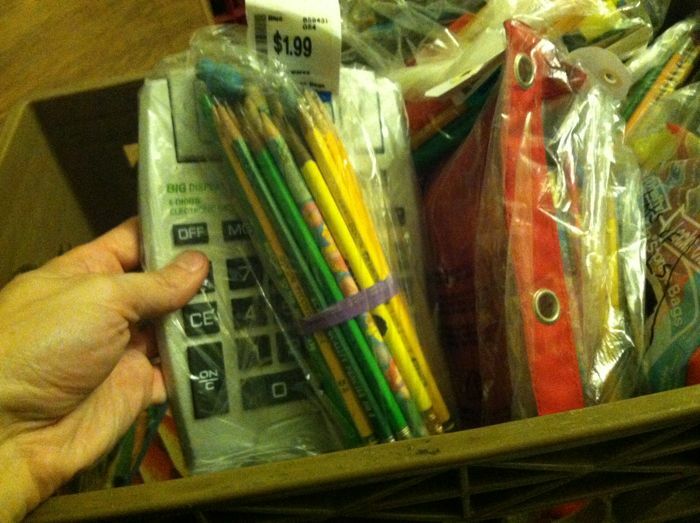 I guess somebody dumped grandma’s junk drawer into a plastic bag and stuck a price tag on it. Then some schmoe on his lunch break bought it, saved it for a few years, and one day the schmoe finally blogged about it. And then–grandmother of all absurdities–someone read about it! Thanks for being someone. It’s gotta be a stretch to read about unopened bags of second hand crap. Let me tell you it’s a stretch to write about them too. I keep wondering, Am I wasting my time? 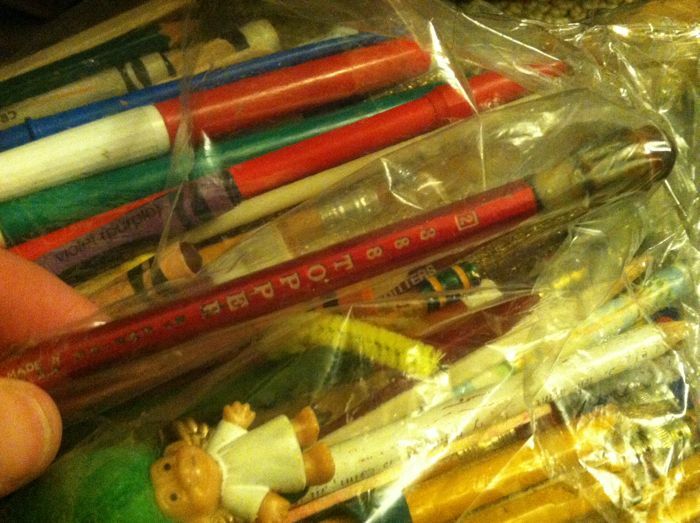 I think I’m incredibly stingy for not ripping these bags open, tossing all the pencils in a shoebox, and using them without a second thought. 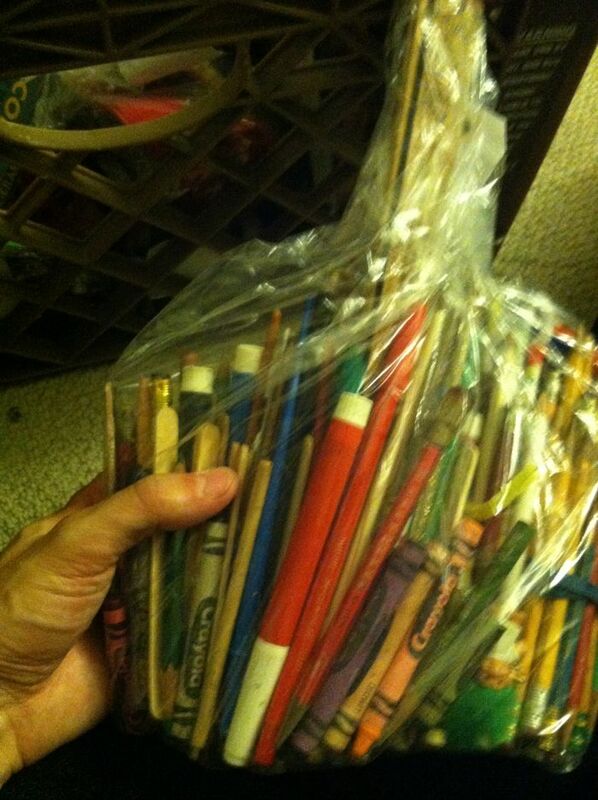 But maybe it’s just as stingy not to spend time worrying about the secret histories of bags of pencils. Maybe it’s even stingier to feel like I don’t have enough energy to “waste” on “trivial” things.